The Michigan Organic Food and Farm Alliance (MOFFA) was organized in 1992 as a non-profit organization with the mission of promoting organic agriculture and the development and support of food systems that revitalize and sustain local communities. MOFFA was one of the first organizations in Michigan and the nation to actively promote these principles. MOFFA completed its fifth annual Organic Intensives on January 12, 2019. This year for the first time we offered four in-depth sessions: Healthy Organic Livestock, Organic Mushroom Production, Technology in Organic Row Crops, and Advanced Organic Soil Management. And once again, participants expressed a high degree of satisfaction with the material and the presenters—over 75% characterized both the content and the presenters as "excellent" and 97% and 99% called the content and the materials either "excellent" or "above average", respectively. MOFFA also attended the Northern Michigan Small Farm Confrerence in January, and plans to have a presence at MIFFS' Family Farms conference in Kalamazoo on February 9 and the Central Michigan Seed Swap on February 24. We'll hope to see you there! Other major conferences coming up in the near future are the 40th Annual OEFFA Conference in Dayton, Ohio on Feb. 14-16; MOSES, Feb. 21-23 in La Crosse, Wisconsin; and the Indiana Organic Grain Farmers' Conference March 6-7 in West Lafayette, Indiana. On Friday, June 8, the Senate Agriculture Committee released their draft of the 2018 Farm Bill. Chairman Roberts requested that proposed amendments be submitted on Monday and the bill is expected to move to the markup stage on Wednesday, June 13, and to be brought to a vote on the floor of the Senate before the July 4th recess. The Senate bill is a rare example of bipartisan cooperation, and contains several provisions that are advantageous to organic agriculture, including language to improve the integrity of the import supply chain, a substantial increase in funding for the Organic Research and Extension Initiative (OREI), and mandatory funding for the organic cost share. The Organic Farmers Association has made the full text of the bill (1006 pages) available online. The National Sustainable Agriculture Coalition has posted articles on six aspects of the bill of greatest interest to family-scale farms and organic production: Conservation, Agricultural Research and Plant Breeding, Organic Agriculture, Local Food and Regional Development, Beginning and Socially Disadvantaged Farmers, and Commodity Programs and Crop Insurance. The House version of the Farm Bill, in contrast, was deeply flawed from a sustainable agriculture perspective, and did not find enough votes for passage last month. NSAC's take on what might happen next in the house is available here. On April 12, House Agriculture Committee Chairman Mike Conaway (R-TX) introduced his draft of the 2018 Farm Bill. While the bill contains limited provisions in support of organic, there are several serious threats as well. The bill would end funding for the Organic Certification Cost Share. It would also legitimize the practice of naming employees of industrial organic operations to seats on the National Organic Standards Board (NOSB) that were clearly meant to be held by small-scale farmers, handlers and retailers. The bill also threatens a number of conservation initiatives and programs that benefit small-scale farms both organic and conventional. The National Organic Coalition has prepared a Scorecard evaluating issues of importance to organic farmers and consumers. The National Sustainable Agriculture Coalition has published a series of blog posts concerning six major issues: beginning and socially disadvantaged farmers, crop insurance and commodity subsidies, local/regional food systems and rural development, research and seed breeding, conservation, and organic agriculture. All in all, this bill represents a significant threat to organic on several fronts. It will go through an amendment process -- make sure your Representative knows where you stand as the House debates these issues. MOFFA’s Annual Report for 2017 is now available on the website, joining other reports going back to 1992, the year of our founding. The year 2017, marking MOFFA’s 25th anniversary, saw the addition of three new board members (pictured at left), publication of The Organic Movement in Michigan and several new fact sheets, and significant changes in the political and regulatory landscape affecting organic production, in addition to another successful year of Organic Intensives, participation in seven state-wide and regional conferences and events, and continued publication and improvement of Michigan Organic Connections, our quarterly newsletter, and our website. Earlier this month MOFFA held its annual meeting, at which the organization elected a new Chair, Emily Nicholls, and Vice-Chair, Jessie Smith. We would like to express our gratitude to John Biernbaum, who served as Chair for the 2016 and 2017 fiscal years, and whose leadership is reflected in the accomplishments documented in the annual report as well organizational underpinnings which will give us a strong foundation as we move into our second 25 years; and to Dan Rossman, who contributed his years of experience with both organic farming and organizational management as Vice-Chair during the same period. Both John and Dan will continue as members of the board. We don't always agree with the Organic Trade Association, but we are with them on this: "After over a decade of stakeholder input, unanimous NOSB recommendations, and a thorough rulemaking process that yielded overwhelming support, USDA's Agricultural Marketing Service (AMS) has taken an egregious action and all-out assault on the integrity of the USDA organic seal by opening a 30-day comment period on its INTENTION TO WITHDRAW the Organic Livestock and Poultry Practices (OLPP) final rule that was released on January 19, 2017." The Livestock and Poultry Rule was a long time coming, having been in development since the the "Final Proposed Rule" for Organic certification first went into effect in 2002. We wrote a bit about the history of the Rule in September of 2016. The implementation of the Livestock and Poultry Rule, initially scheduled for March 19, 2017, was postponed by the incoming Trump administration until May 19, then by another six months until November, and finally by another six months, until May, 2018. Then on December 18, the Department published its intent to wthdraw the Rule. This action flies in the face of public opinion, which was documented by the Department's own request for public comment earlier this year to be in favor of immediate implementation of the rule by an overwhelming majority. The OTA filed a lawsuit in September to attempt to force the USDA to stop delaying the implementation of the Rule, and has amended the lawsuit in response to the USDA's action in December. The USDA public comment period is open now through January 18. It is extremely important that every person, business, and organization with a stake in the integrity of the Organic label SUBMIT A PUBLIC COMMENT in their own words during this period. The National Organic Standards Board will hold its fall meeting in Jacksonville, Florida, October 31 - November 2. The board intends to discuss organic imports, review sunsetting of accepted inputs for organic operations and new petitions, a proposal to eliminate the incentive to convert native ecosystems to organic crop production, and, for the third time, the question as to whether hydroponic/aquaponic operations should be allowed to be certified organic. We encourage everyone who has a stake in organic production to make their opinions known in advance of this meeting. For more information, see the Policy Page. On May 26, 2017, MOFFA published the book The Organic Movement in Michigan, which contains a wide variety of information: historical summaries of the major organic organizations, reports on various organic activities, and essays about the past, present and future of organic farming. Edited by Maynard Kaufman and Julia Christianson, with contributions from sixteen of those who were a part of the movement spanning the last 45 years. Wes Jackson says, "Perhaps the best documented history of The Organic Movement generally comes out of Michigan. The writers—practitioners beginning in the early 70s—have bothered to write a comprehensive history of the local, organic, community supported story that de facto can serve as a primer for other states less far along. Sharing of ideas has long been a way of life for the movement so the already seasoned are sure to gain from a reading of this as well." 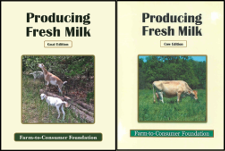 The Farm to Consumer Foundation announces the publication of Producing Fresh Milk — Goat Edition which joins the previously published Cow Edition. These books are for readers who are interested in starting a dairy to provide fresh milk to families, producers currently shipping raw milk to the dairy industry, but are interested in providing fresh milk to families, or those currently providing fresh milk who would like to improve their dairy operations. Learn step by step starting from the dairy business, going into about the farm, the quality of fresh milk production and ending with about the milk. The can be purchased on the Farm to Consumer Foundations website at https://f2cfnd.org/shop/. Download the poster here. Keep the Soil in Organic—The public comment period has ended on the question of whether hydroponic operations should be able to be certified organic. The issue will (we hope) be decided at the Spring NOSB meeting in Denver on April 19-21. For those who would like more information, MOFFA's Chair Dr. John Biernbaum served on the hydroponics task force, and reported on his experience in our September and December newsletters. The Organic Check-Off—The public comment period on this issue ends at midnight on April 19. The “check-off” program would use funds collected from producers and handlers of organic products for promotion and research—it’s the program that brought us the “Got Milk?” and “Incredible Edible Egg” campaigns. Again, the vast majority of organic farmers are opposed to this additional “tax”, feeling that promoting organic sales now will not increase organic acreage in the US but may well increase demand for lower priced organic imports. The check-off has been strongly promoted by the Organic Trade Association, representing corporate interests, and the public comments are already full of their form letter. There is more information on the check-off at noorganiccheckoff.com. You can view the proposed rule and submit your comment at https://www.regulations.gov/document?D=AMS-SC-16-0112-2265. The 2018 Farm Bill—The last item we want to mention does not require an immediate response, but we want people to be aware of what’s coming. Legislators in Washington have already begun to talk about the 2018 Farm Bill, and given the current climate, there is a real danger that we might lose a major source of support for organic agriculture when this bill becomes law. The National Sustainable Agriculture Coalition has been blogging about the hearings on the Hill; the initial report is here, and subsequent posts can be viewed at http://sustainableagriculture.net/category/farm-bill/. We encourage everyone who cares about the future of organic to join NSAC’s email list or RSS feed, and stay informed. There are opportunities to sign up for the email newsletter and the RSS feed on the left hand side of both webpages mentioned above.